A cyberespionage group with a toolset similar to ones used by U.S. intelligence agencies has infiltrated key institutions in countries including Iran and Russia, utilizing a startlingly advanced form of malware that is impossible to remove once it's infected your PC. 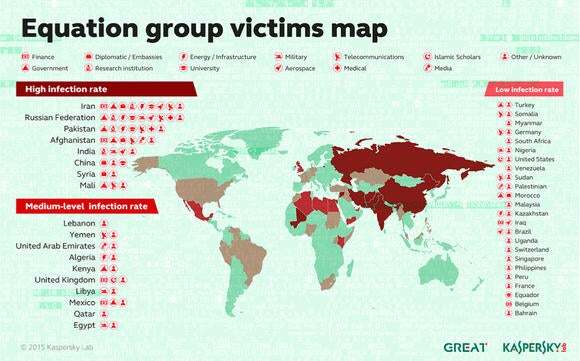 Countries hit the most by Equation include Iran, Russia, Pakistan, Afghanistan, India and China. Targets in those countries included the military, telecommunications, embassies, government, research institutions and Islamic scholars, Kaspersky said. Kaspersky’s most striking finding is Equation’s ability to infect the firmware of a hard drive, or the low-level code that acts as an interface between hardware and software. The malware reprograms the hard drive’s firmware, creating hidden sectors on the drive that can only be accessed through a secret API (application programming interface). Once installed, the malware is impossible to remove: disk formatting and reinstalling the OS doesn’t affect it, and the hidden storage sector remains. “Theoretically, we were aware of this possibility, but as far as I know this is the only case ever that we have seen of an attacker having such an incredibly advanced capability,” said Costin Raiu, director of Kaspersky Lab’s global research and analysis team, in a phone interview Monday. A group of cyberspies called Equation that uses similar techniques as the NSA has struck at least 30 countries using never-before-seen malware that infects hard disk drives. The report said Equation has knowledge of the drives that goes way beyond public documentation released by vendors. Equation knows sets of unique ATA commands used by hard drive vendors to format their products. Most ATA commands are public, as they comprise a standard that ensures a hard drive is compatible with just about any kind of computer. But there are undocumented ATA commands used by vendors for functions such as internal storage and error correction, Raiu said. “In essence, they are a closed operating system,” he said. Obtaining such specific ATA codes would likely require access to that documentation, which could cost a lot of money, Raiu said. The ability to reprogram the firmware of just one kind of drive would be “incredibly complex,” Raiu. Being able to do that for many kinds of drives from many brands is “close to impossible,” he said. “To be honest, I don’t think there’s any other group in the world that has this capability,” Raiu said. It appears Equation has been far, far ahead of the security industry. It’s almost impossible to detect this kind of tampering, Raiu said. Reflashing the drive, or replacing its firmware, is also not foolproof, since some types of modules in some types of firmware are persistent and can’t be reformatted, he said. Given the high value of this exploitation technique, Equation very selectively deployed it. Another of Kaspersky’s intriguing findings is Fanny, a computer worm created in 2008 that was used against targets in the Middle East and Asia. To infect computers, Fanny used two zero-day exploits—the term for a software attack that uses an unknown software vulnerability—that were also coded into Stuxnet, Kaspersky said. Stuxnet, also a Windows worm, was used to sabotage Iran’s uranium enrichment operations. It is thought to be a joint project between the U.S. and Israel. “They are definitely connected,” Raiu said. Both Stuxnet and Fanny were designed to penetrate “air-gapped” networks, or those isolated from the Internet, Kaspersky said. The Equation group also used “interdiction” techniques similar to those used by the NSA in order to deliver malicious software to targets. It is unknown how the CDs were tampered with or replaced. “We do not believe the conference organizers did this on purpose,” Kaspersky said. But such a combination of exploits and malware “don’t end up on a CD by accident,” it said. The NSA’s Office of Tailored Access Operations (TAO) specializes in intercepting deliveries of new computer equipment, one of the most successful methods of tapping into computers, wrote Der Spiegel in December 2013, citing a top secret document. The German publication was one of several that had access to tens of thousands of spy agency documents leaked by former NSA contractor Edward Snowden. Kaspersky uncovered the trail of the Equation group after investigating a computer belonging to a research institute in the Middle East that appeared to be the Typhoid Mary for advanced malware. Raiu said the machine had French, Russian and Spanish APT (advanced persistent threat) samples on it among others, showing it had been targeted by many groups. It also had a strange malicious driver, Raiu said, which upon investigation lead to the extensive command-and-control infrastructure used by Equation. Kaspersky analysts found more than 300 domains connected with Equation, with the oldest one registered in 1996. Some of the domain name registrations were due to expire, so Kaspersky registered around 20 of them, Raiu said. Most of the domain names aren’t used by Equation anymore, he said. But three are still active. The activity, however, doesn’t lend much of a clue as to what Equation is up to these days, as the group changed its tactics in late 2013.